What is FSC®? 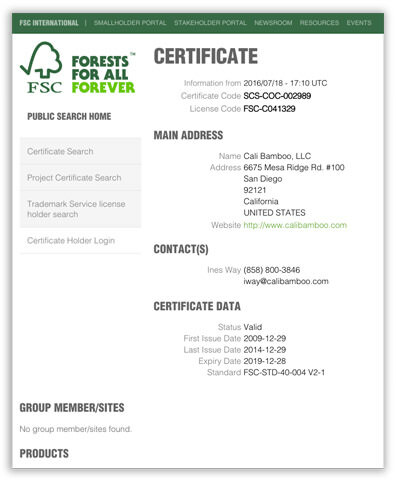 The Forest Stewardship Council or FSC® is an independent, non-governmental, not-for-profit organization established to promote the responsible management of the world’s forests and to certify forest products. The FSC’s partners, like Cali Bamboo, feel that natural resources can be processed in ways which ensure a healthy ecological balance is maintained, so that “the social, economic, ecological, cultural and spiritual needs of present and future generations” can be met. • FSC® certified forests now represent the equivalent of 5% of the world’s production forests. • In 2010 more than 120 million hectares of forest in over 80 countries worldwide are certified to FSC® standards. • The sales of FSC® certified products is valued at over 20 billion US dollars. • In 2008, 50% of the companies in the forest product supply chain attained FSC® certification. Visit the Forest Stewardship Council’s site to learn more!